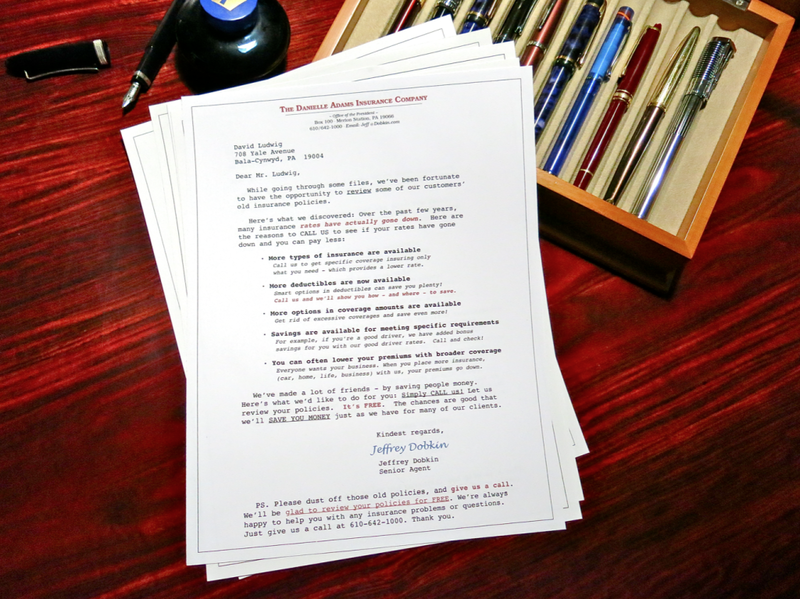 A great opportunity to buy our Books, Audios — and our Awesome Sales Letters! 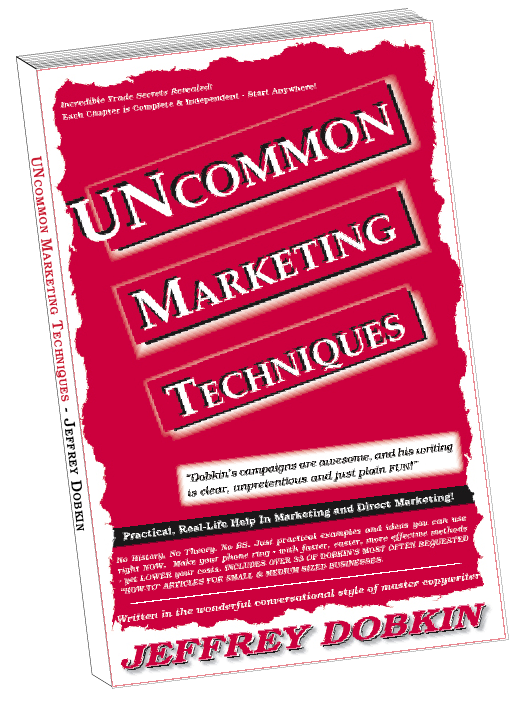 We know, we know… Marketing Books – ugh! Information is presented in Dobkin’s own brilliant conversational style. Fast reads. Enjoyable. Yet the tactical marketing information runs quite deep. Information is fast paced without fluff or BS. We believe every client relationship, every client, every sale starts with one word: Hello! Need your phone to ring? That’s exactly what our sales letter templates do: they make your phone ring. These letters actually don’t sell anything… unusual for a series of sales letters. · They have only one goal – to make people call you. · Then YOU make the sale – to someone interested in your offer. · You can see a FREE sample of each of our insurance sales letters, financial advisor sales letters, and our Network Marketing Letter series on this website. · To encourage people to call you, I’ve said “Call!” up to 8 times in a single page. 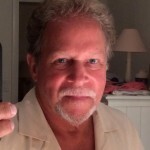 · I’ve given your phone number 2 times, 3 times, sometimes 4 times within the body of the letter. “I’ve tried to bring to the center of the reader’s attention a bulleted list of very plausible reasons their insurance rate may really come down – so that they call. As with all of my sales letters, I don’t sell products – the only objective of the letter is to make readers pick up the phone and call you now. Order today – it couldn’t be any easier! Your download of each of these letter series is instant! Simply print these sales letters on your letterhead and mail. Or — take the letter files, which are written and designed in Microsoft Word (and ready to mail merge! 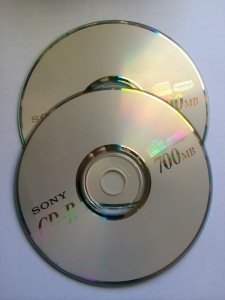 ), to any quick-copy shop or any commercial printer. Whether you are printing 25, 2,500 or 25,000 – order now, print and mail these letters tonight and have your phone ringing by the weekend. As always, thank you for your business and your trust, we appreciate it. Questions? Comments — we are always happy to help. Please call us at 610-642-1000. Thank you. Additional information — Successful Low Cost Direct Marketing Methods, please CLICK HERE! Additional information — UNcommon Marketing Techniques, please CLICK HERE! 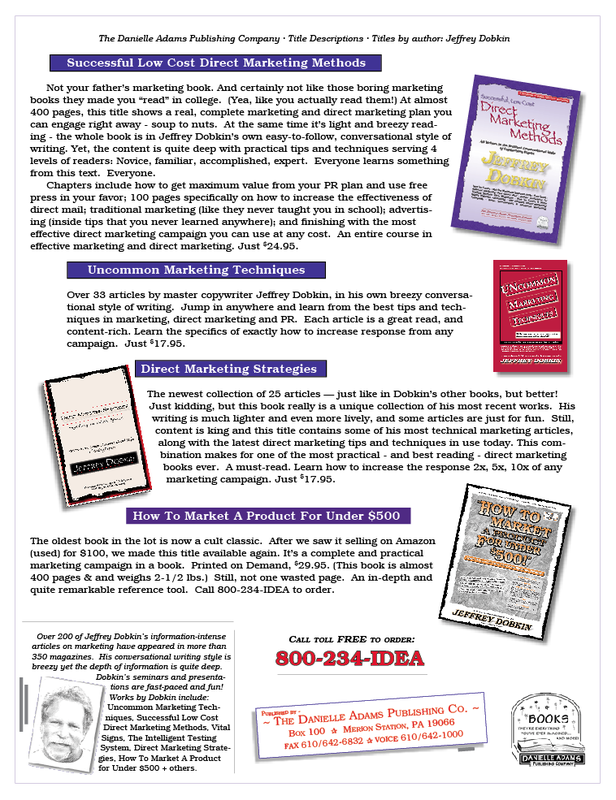 Additional information — Direct Marketing Strategies, please CLICK HERE! 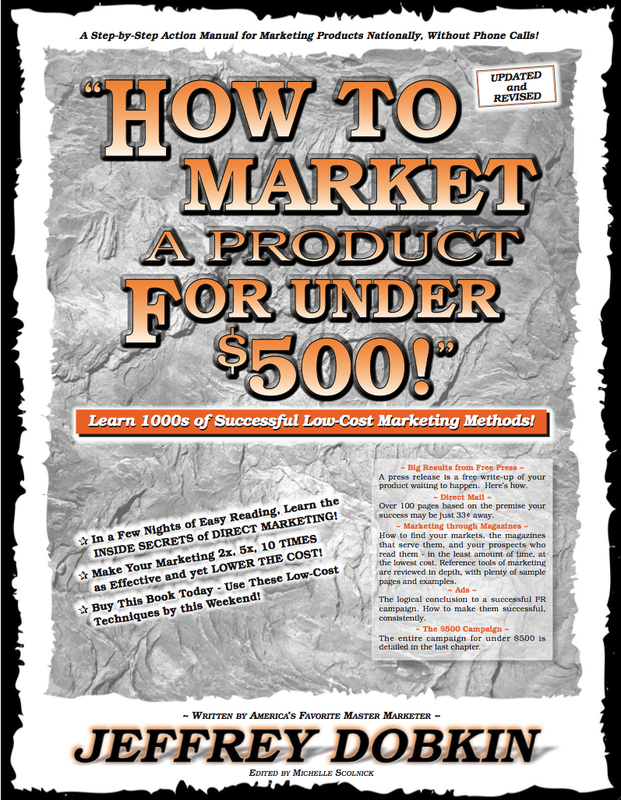 Additional information — How To Market A Product for Under $500!, please CLICK HERE! This is a no-hold barred presentation that is jam-packed with high velocity information every inventor should know. Jeffrey takes you through the whole trip of invention: manufacturing, prototyping, sourcing materials and vendors, patenting, pricing, finding industries, marketing, licensing. Dobkin shows you a multitude of tricks and tactics he’s learned from his 15-year tenure seated on the Board of the American Society of Inventors. Dobkin’s comment: “This video is well worth the thirty bucks. If you have an invention I can’t really describe how tremendously valuable this video will be for you.” It’s a synopsis of what I’ve learned from my 15 years in the inventing community. You’ll learn more about invention, marketing, patents, licensing and developing your product in one hour than you’ll learn in four years in college. 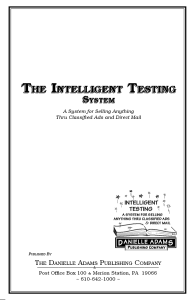 The Intelligent Testing System PDF and Audio Just $149 for the entire program. Select and buy pdf, audio, or both, here. This is a one hour, no bs, practical course in mailing lists. Learn more useful information about mailing lists in one hour than you can learn in a full year of direct marketing classes in any college. 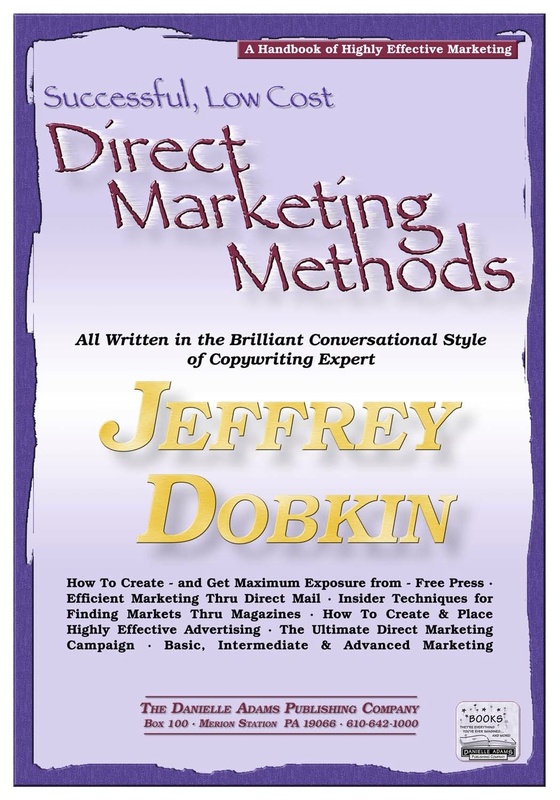 Markus Allen knows what questions to ask (he owned a mail house for years), and Dobkin has years of experience as both a buyer and a seller of mailing lists – and has the in-depth working knowledge to provide the answers. (Learn more) Buy Now. Enjoy this fun, humorous and expert direct marketing presentation to a cold room at 10:30 AM to kick off the National Postal Forum in Washington, D.C. Hear Jeff in one of his few sober I mean somber moments on this road trip to the the nation’s capital. Follow Jeff as he keeps hung-over conference attendees awake through his fun-filled presentation on effective direct mail. Lots of tips and techniques in low cost successful marketing methods. Buy Now. 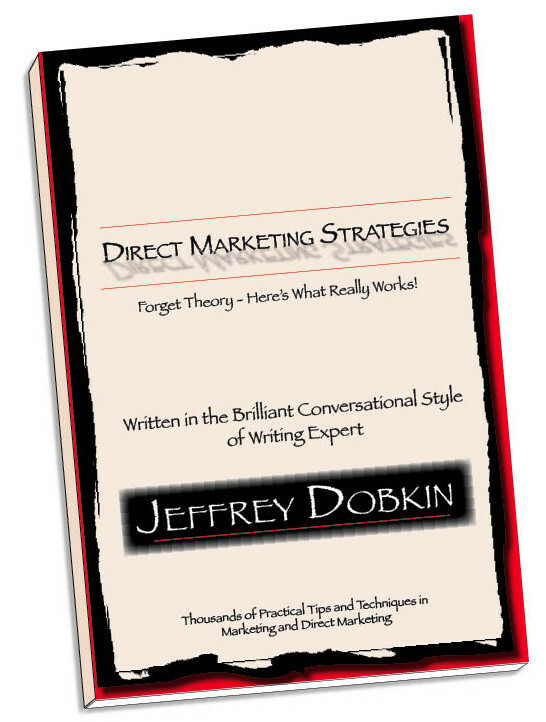 What makes Jeffrey Dobkin’s presentations so wonderful… is it the huge amounts of practical ideas he brings to each presentation? Is it the stale jokes but who cares they’re still funny? Is it the sheer volume of new ideas on how to increase the response you receive from any mailing you send? Well, yes — it’s all of these. This is a humorous, fun filled presentation yet completely jam-packed with practical, useful direct marketing information. More Info. Buy Now. Subliminal Weight Loss Audio Systems – Lose weight while you watch TV! Yes! I’m ready to lose weight! If you’re really ready to lose weight, without dieting or pills, these audio files contain the introduction, instructions, and the affirmations for Dobkin’s very own subliminal weight loss system. Listen to these audio files at a very low volume level – hear them subconsciously – while you are doing other things (like watching TV!) It may be a new way of learning to you, but subliminal training is just one of the ways used for years to train athletes and professional sports figures, and train just about every olympic athlete. (Learn more). An original program created by Jeffrey Dobkin. Buy Now. The Brain Injury Foundation Newsletter. Free! Get this newsletter that’s filled with heart facts, brain facts… and most of all learn Dobkin’s Technique to delay brain damage in Sudden Cardiac Arrest victims. If you have a Sudden Cardiac Arrest, you have 3 to 5 minutes before irreversible brain damage starts to occur. Over 295,000 people suffer a Sudden Cardiac Arrest (heart attack) each year, only 5% live long enough to reach a hospital alive, many who are over this 5 minute limit live the rest of their lives with brain damage. 95% of SCA victims don’t survive at all. 95%! A hard copy of this newsletter is sent on request (let us know how many copies you’d like) when you make a donation to this life saving cause and give us your mailing address. View Page. Dobkin’s technique is a way to delay hypoxic (low oxygen) ischemic (low blood flow) brain injury for up to an hour. Seriously, Dobkin has spent 30 years of research in the yellowing pages of old research articles, teletype machines, microfiche files and back rooms of the medical libraries of Philadelphia in pursuit of his own intellectual curiosity to figure out his method of delaying brain injury and saving people’s lives. You’re much luckier – you don’t need to spend years n research, you can learn Dobkin’s simple technique to delay brain injury and death in just a few minutes of easy reading. For deeper information please go to BrainInjuryFoundation.org. View Newsletter.